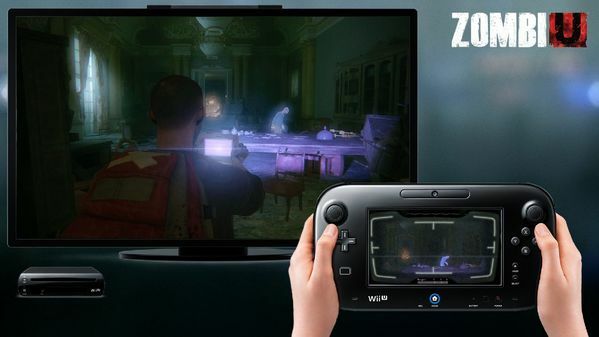 ZombiU review: Anarchy in the U.K.
Keep track of all of Joystiq's Wii U launch coverage on our Wii U hub page! I have twelve pistol bullets left, one crossbow bolt, a Molotov cocktail and about half a dozen zombies between me and freedom. I've spent the last half hour on an undead killing spree, emptying most of my guns and exhausting my medical supplies. I've become a fairly confident zombie slayer over the last few days, but rarely have I come across this many at once, especially in close quarters. They're just milling about on the other side of an open door. I know that because I can spot their pings on my radar. There's no telling what kind of zombies are over there though. Run of the mill civilians? The Molotov would make quick work of them. But what if there are undead cops, decked out in bullet-proof, fire-resistant riot gear? I shuffle through my backpack, glancing away from the television and toward the Wii U's gamepad in order to do so – they haven't spotted me, so I feel relatively safe rooting through my supplies. After some soul searching, I decide my aim – and certainly my nerves – just aren't good enough. I'm betting on the Molotov. I take a deep breath, listening to it hiss through my teeth, and step through the door. This is moment to moment survival. This is ZombiU. London has been overrun with the undead. Playing as a survivor, it's your job to stock up on weapons and supplies and, eventually, to uncover the mystery surrounding the outbreak. 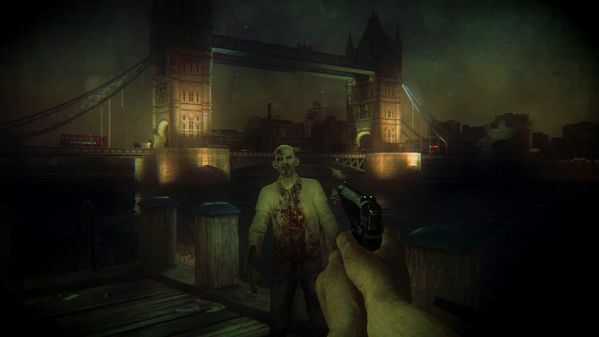 ZombiU is unique in a number of ways, including its story, which mixes both the biblical and the historical. As ZombiU would have it, John Dee, 16th century alchemist and spy for Elizabeth I (who signed his letters to the Queen "007," apparently), predicted that a "Blight" would strike London in the year 2012. As you may have guessed, he was right, and now our survivor will become key to solving Dee's ancient quest for a cure. There are lots of letters and newspaper clippings to find within the game and, as Ubisoft's own Assassin's Creed has proven, injecting a little history into the framework of a game can be great fun. The player's survivor is guided by the disembodied voice of "the Prepper," an ex-military man with eyes all over London and a handy safe house tucked away in one of the city's tube stations. 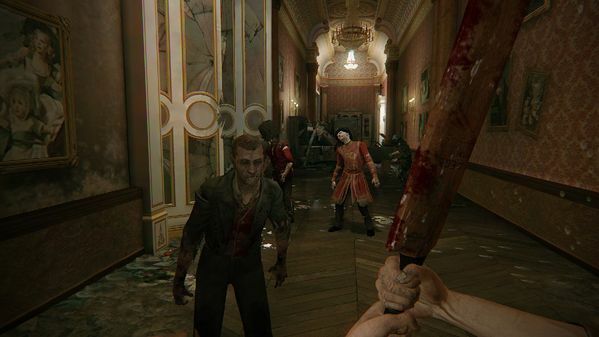 This acts as ZombiU's central hub, and from here you will venture out into the city, scouring for equipment and clues to eradicating the Blight. The campaign will take your survivor to many places, ranging from simple suburbs to the Tower of London to Buckhingham Palace itself (the latter two complete with silly-hatted, zombified Beefeaters and Queen's Guards). What's initially most striking about ZombiU is just how intimate its encounters are. With a few rare exceptions, you aren't mowing down hordes of the infected. Instead, you'll more often face one or two at a time and, believe me, that's enough. With a very limited supply of ammunition, and only limited space in which to carry it, you'll have to decide when and where it will be most useful. More often, I resorted to my trusty cricket bat. Now, your survivor is just an everyday citizen. Your aim is poor, and taking out even a single zombie with the bat is an exhausting ordeal. It takes a moment to prepare and swing the bat, and missing your swing could mean a nasty scratch or even death if a zombie gets close enough. Guns offer more stopping power, but the undead move erratically, making those all important headshots difficult to land, even more so in the heat of the moment. You can always pump a body full of bullets – and you probably will at least once – but remember those bullets are hard to come by. Taken together, all of these elements conspire to remove almost any sense of empowerment, creating some of the most intimidating undead I've seen in quite a while. Even a pair of them is cause for concern, especially when the concussive, mind-rattling music kicks in. The atmosphere occasionally reminds me of Monolith's often overlooked Condemned, which is definitely a good thing. ZombiU is unforgiving, and it's expected that you will die. You may have noticed that I haven't given the player's survivor a name, and there's a reason for that. Should your survivor die, the player simply wakes up in the safe house as a new survivor, complete with their own name and ID. Naturally, since you're now a completely different person, all the equipment you spent so much effort acquiring is gone. The twist, and it's a good one, is that your full backpack is still out there – now it's just attached to the undead back of your most recent survivor. If you want it back, you'll have to return to where it was lost and, essentially, kill yourself. If you die without reacquiring your pack, that equipment is gone for good. That's all assuming you're playing on normal difficulty, of course. Play in "Survival" and you get one life. Period. As much as ZombiU does with the Wii U GamePad, the best feature is easily the simplest. The GamePad acts as your map screen and a fabulously useful radar. Each radar wave will send back pings of anything in motion nearby. You can't rely on it one hundred percent of the time though. For one, animals like crows or rats will send back pings. More than once I felt my heart pounding as I approached what I thought was a horde, only to wind up scaring off a murder of crows instead. Furthermore, motionless undead won't set off the radar, so you can (and will) still be ambushed from time to time. You absolutely come to depend on your GamePad's radar, and trust me when I say it enables some truly tense, unforgettable moments. They're almost as tense as the moments when the game takes it away. The pad also serves as your inventory screen, meaning you'll look away from the television screen (and potentially some unnoticed zombies) in order to access it. Your survivor comes to a complete stop, and you have to physically drag and drop items to and from the backpack, which takes time. That landmine in your pack might be perfect for your current situation, but you'll have to put some distance between you and the undead before you can pull it out and equip it. While the touch screen inventory management can heighten the tension, there are also elements that don't make sense. Reloading all of your weapons can be a pain, as you have to drag them to your holster (which holds up to six items or weapons), equip them and finally reload. Furthermore, you can't drag an equipped weapon back into your pack, meaning you'll have to equip a different weapon first. Considering how vital it is to have all your weapons loaded at all times, repeating this same dance of moving things to and from the backpack, of equipping and un-equipping weapons, gets tedious. The GamePad also serves as an augmented reality viewer of sorts. A special black light mode can scan the environment for items and zombies. The touch screen also acts as the scope for sniper weapons. In either mode, you can adjust the view with either tilt or the right analog stick. I found that the stick was best for general adjustment, while tilt was great for fine tuning. One note: While you can invert the Y axis for gameplay on the television screen, the GamePad screen locks the right analog stick to "Normal" view. In other words, when using the stick to adjust the view on the GamePad screen, up is always up and down is down. If you play inverted like I do, it takes some getting used to. You use the GamePad screen for a handful of other activities, the best of which are punching numbers into keypads, picking locks and reading documents. The rest are confined to things like prying off barricades, removing bars from doors and drawing nasty zombie pus with a syringe. These three things are all accomplished by simply tapping the screen as fast as possible, which seems like an arbitrary and unnecessary choice. For the most part though, the GamePad only enhances what is already a wonderfully frightening experience. Granted, none of these features really need a second screen to work, but they do add an extra layer of perceived reality, and the radar in particular feels completely natural. In another clever turn, the GamePad speakers also serve as the speakers for radio transmissions, again adding to the illusion. Multiplayer mode is an interesting experiment. Like most Wii U multiplayer modes thus far, ZombiU's is local. It involves two players, one on the GamePad, and one using a Wii Remote and Nunchuk or, preferably, the Wii U Pro Controller. One player takes on the role of a survivor and attempts to capture several control points. The other player, meanwhile, deploys zombies using the Gamepad, which displays a map of the arena and the survivor's position. The zombies have to capture control points as well and, as he acquires more points, the undead overlord can deploy more powerful zombies. It's diabolically fun to set up ambushes with the touch screen, dropping zombies both in front of and behind the lone survivor. I'm not sure it will have much lasting appeal, especially with the two-player limit, but it's a neat proof of concept and something that could definitely serve as the basis for a larger game. In the end, it's the atmosphere of ZombiU that sticks with you. With your life hanging by a thread at any given moment, it demands keen, breath-held focus. You can feel it when your survivors' voices shake as they split the skull of an undead, in their panicked panting as they sprint from danger. There's no one to help you, no respawns. It's just you, a pack full of supplies (if you're lucky) and the horde. You develop your own rules, a code that will ensure your survival. Don't shoot first. Assess the situation. Know your exit. Live. There are hiccups, sure. Inventory management can be annoying. Some of the touch screen minigames are unnecessary. Physics can be floaty and strange, notably when fighting zombies on stairs. These minor problems, however, rarely interfere with the pulse-quickening thrill of diving into a mass of infected and coming out alive on the other side. ZombiU isn't for everyone, but those who stick with it, through its unforgiving and occasionally frustrating difficulty, there's a an exhilarating experience to be had. I went through seven survivors before I finally stumbled upon the one who would carry me to the end: Eliza Barker, 29, barrister. Even in the midst of a zombie apocalypse, I guess you need a good lawyer. This review is based on a retail copy of ZombiU for Wii U, provided by Ubisoft.